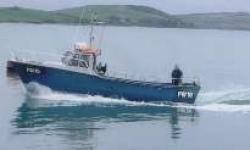 Fishing trips running form Padstow Harbour, 2 hour mackerel, 4 hour bass, wreck and reef and all day trips (Sharking and Wrecking). Emma Kate 2 is a Lochin 33, an excellent sea boat. She has a large spacious deck area and has seating facilities for all passengers. There is a toilet on board. She is equipped with all the modern Fishing technology such as VHF & DSC radio, fish finder and GPS plotter. She also carries a life-raft and all the lifesaving equipment to comply with the MCA regulations. All Fishing equipment is supplied for all trips, although passengers are welcome to use their own. For bookings please telephone the skipper Lee Wicks on 07970595244 during the day or 01841 533319 during the evening. The Skippers qualifications include VHF & DSC Radio, Safety Awareness, PHC Boatman's A&B, Category 2 code of practice.